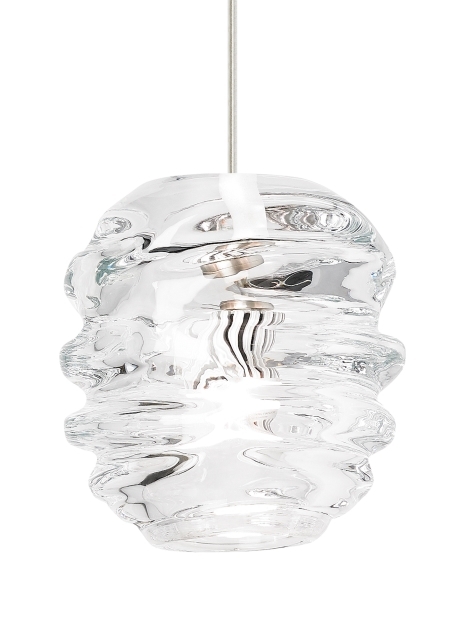 The thick, organic flowing glass of the modern Audra Pendant light from Tech Lighting is anything but ordinary. This one of a kind pendant is painstakingly molded by European artisans to create an incredibly deep and rhythmic silhouette. At 5.9” in height, this beautiful and unique pendant is the perfect scale to be used as kitchen island lighting, bath lighting flanking a vanity or installed in a cluster as a modern interpretation of a chandelier in a dining room. With its five on-trend glass colors including Clear, Sultry Smoke, Surf Green, Winter White and Steel Blue, the Audra light fixture may be used to add a pop of color to complement the décor in your special space. Includes low-voltage, 35 watt halogen bi-pin lamp or 8 watt, 300 delivered lumen, replaceable LED SORAA® module. Dimmable with low-voltage electronic or magnetic dimmer (based on transformer). Fixture provided with six feet of field-cuttable cable.